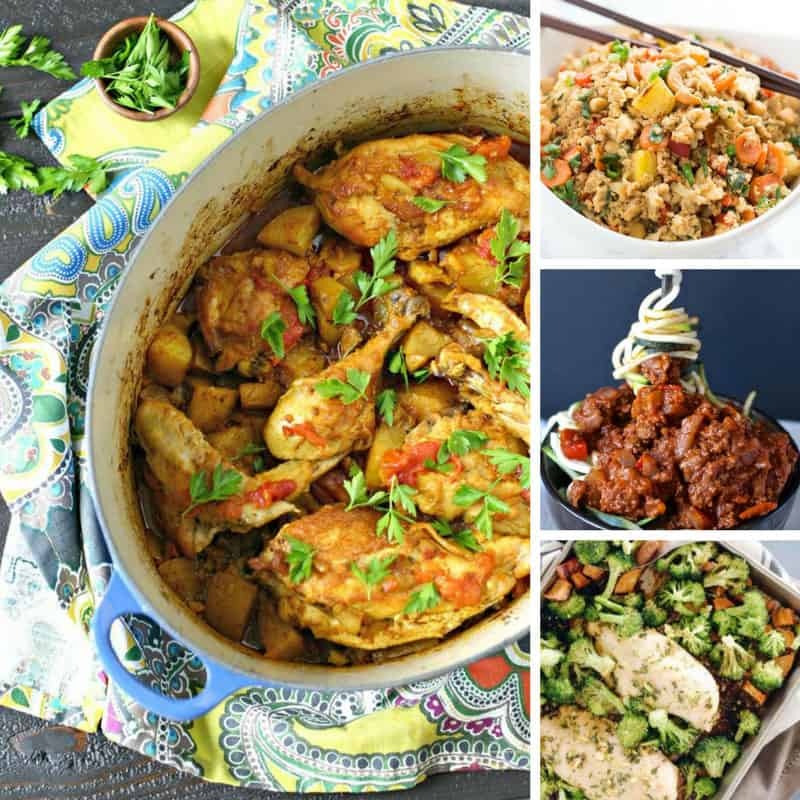 Home > Recipes + Food > Easy Family Dinner Ideas > 12 Quick & Easy Paleo One Pot Meals for Hectic Weeknights! If you hate doing dishes you need to check out these DELICIOUS Paleo One Pot Meals. They’re perfect for busy weeknights so add them to your meal plan. One Pot Paleo Meals Save on Time and Doing Dishes! If you hate doing dishes as much as I do you’re going to love today’s collection of quick and easy Paleo on pot meals, because that’s all you use. One pot. Brilliant right? Not only are they quick and easy to prepare but they taste delicious and you don’t have a pile of dishes to contend with at the end! I thought I’d mix things up a little today so as well as picking out some of the best One Pot Paleo dishes over on Pinterest I also scoured YouTube too and found some videos for you to drool over! Another great option to cook up for your family dinner are spicy Thai noodles, which is a popular Asian dish. However, instead of regular noodles you are going to make noodles from zucchini, cucumber and carrots using a spirilizer. If you need an excuse to lure your kids into the kitchen then this is it, because spirilizing veggies into noodles is SUPER fun for kids! You can then add ingredients like soy sauce, red pepper flakes, carrots, mushrooms, garlic, ginger, onions, and cilantro to the pan with those yummy noodles. To make it even more spicy, add a little bit of sriracha as well. This can also be added after they are cooked to add a bit of spice and flavoring to the noodles. ==> 10 Super Easy Spiralizer Recipes You Need to Feed Your Picky Eater collection! For this recipe, you actually want the flavoring from the steak on your veggies, so you can cook the meat from raw in the same pan. Just don’t forget that you need to switch the vegetable oil for coconut or olive oil. Pan-fry your steak, preferably sliced into thin strips and seasoned to taste. Once the steak is done keep it in the pan, but remove some of the grease. Now add your fajita vegetables like peppers and onions and sautee them with the steak until tender. Now you’re ready to add some lettuce and pile everything into your fajita wraps! ==> Paleo friendly recipes collection! Pork chops are a popular dinner option, but many people take multiple steps to make them because they often pan fry for a few minutes, then pop them in the oven. You don’t need to do this though because you can cook them fully in your cast iron skillet. Add some olive oiil to the pan and season the pork chops with rosemary, garlic, lemon, sea salt, and pepper to taste. You can then fry on each side of a cast iron pan that has been heated beforehand. Serve the pork chops with apples or your own homemade applesauce for a yummy family dinner. ==> cast iron skillet recipes collection! Wondering which is the best grater for cauliflower rice? It’s this one! Stir-fry is the perfect example of a one pot meal that can be made paleo friendly. You just need to make sure that your chicken is fully cooked before you add any other ingredients. It’s as simple as heating up the pan with coconut oil or olive oil (don’t forget vegetable oil is not paleo friendly), then adding the chicken and veggies and cooking until the meat is thoroughly heated and the veggies are nice and tender. Previous PostPrevious 21 Easy Homemade Halloween Costumes for Kids – ADORABLE! Next PostNext 19 Labor Day Burger Recipes for a Killer Cookout!